As I wrap up this series, I find myself looking at the world around me, and my local context here in the US, and seeing the impact of ableism, discrimination, and/or simple lack of empathy. For example, with the impending removal of coverage and protections provided by the Affordable Care Act, so many disabled individuals will lose health coverage with potentially devastating consequences–and yet our politicians are suggesting that “health savings accounts” will somehow close the gaps. No, and no again. This is not okay. Although I’m not an activist by default, this is a time for activism. In truth, it’s always a time for activism no matter where or when you live. It’s just that there are times when injustices and inequalities and discrimination are more clear, and times when they seem less apparent, though they are no less virulent. So, as we all go forward with our days, I challenge us all to think about those things we can do. And then do them. The daily news can be overwhelming–it feels as if there are five dozen fires that need to be fought, and how does one person do it all? The answer is that one person doesn’t. This past fall Tanehesi Coates spoke at Xavier here in Cincinnati. During the Q&A, he touched on this issue very briefly. When asked about activism, he said he was not an activist. He was a writer, and that was what he did best, so that was what he focused his energy and time on. His writing became his activism. He left the rest of what must be done to everyone else. If each person individually finds what it is they can do best, and focuses on that, all of those five dozen fires will have a team of folks coming together to work on them. That doesn’t mean we wear blinders, or don’t support other causes–sign the petitions! Make the phone calls you can make! (Or send the e-mails.) But above all, look at what you are most able to do, and then bring those skills to bear on the issue of your choice. 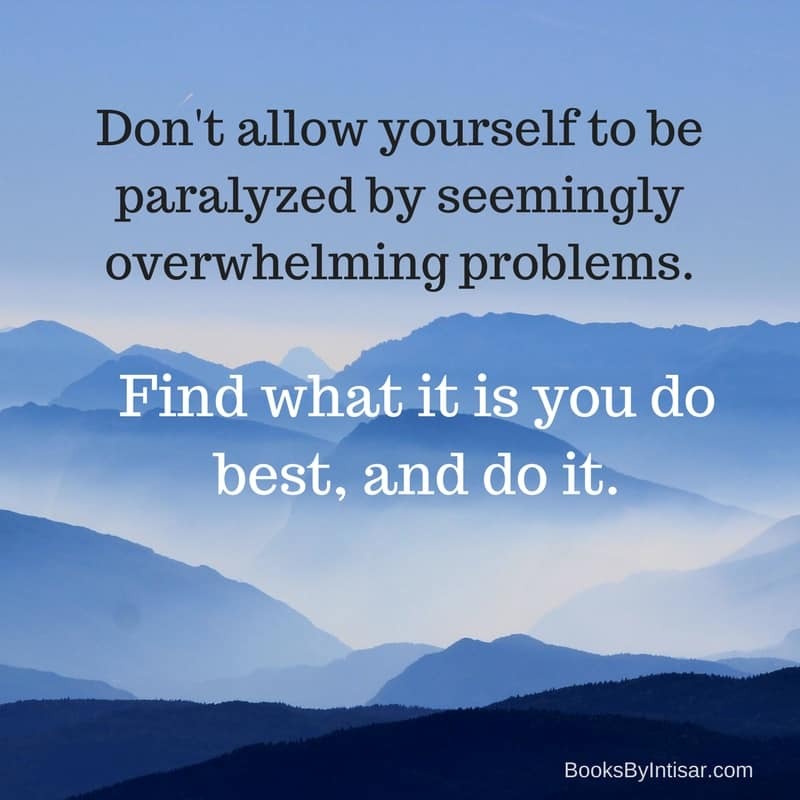 Don’t allow yourself to be paralyzed by seemingly overwhelming problems. Find what it is you do best, and do it. If you love to organize, connect with an organization that needs your help setting up the next rally or petition drive. If you have strong ties with faith communities, join an interfaith coalition working to address issues. Are you intimately tied to a marginalized community? Perhaps you can volunteer as a diversity or accessibility coordinator at a civil rights organization (or wherever!). You get the idea: focus on your skills, pick one thing, do it well. If you don’t have a huge amount of time, that’s still okay. Perhaps all you can do is join the e-mail lists of two or three organizations working on a spectrum of issues, and when they send you action alerts to sign petitions or make phone calls, that’s what you do. It’s so important to keep ourselves informed and to take even these seemingly small steps. They all make a difference. And, whenever you notice a community being excluded–whether intentionally or by accident–now is the time to speak up about it. We cannot afford for the lives of disabled individuals to be erased, forgotten by the media and literally destroyed by legislation. We cannot afford for the lives of immigrants to be made hell by legislation and “crack downs” that make no one safer and merely increase fear and instability. We cannot afford for a LGBTQ+ communities to lose their rights, to be bullied and harassed and barred from basic necessities (like bathrooms). We cannot afford any of these things, and so many other things I can’t begin to list here. So let us stand together. Let us look for our strengths, focus our work on those things we are best able to do, and support each other as we move forward. Because we cannot afford to slip backward any further. Thank you all, so much, for being a part of this series–as a contributor, as a reader, as a person who cares.